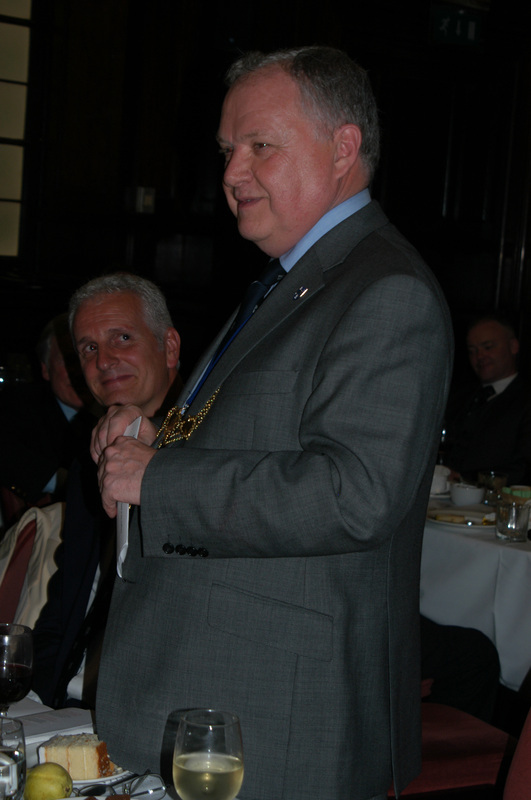 On the 18th September 2014 43 Merry Masons and friends met in the saloon of the Trades Halls to have a rustic meal of pies; bridies and sandwiches. This is in high contrast to the meal that most will celebrate at the Deacon's Choosing Dinner the following evening. The evening is also a huge contrast to most of the events held in the Trades Halls where fine dining and classical music are expected. Prior to the Pear Eating the Master Court met and conducted some business and swore in some new members who were attending the Pear Eating. This is normally the last Master Court that the Deacon will chair prior to handing over the reins at the following day's Choosing Meeting. The evening started with Past Deacon Dr. John McInnes giving a toast to the "BESIR". For those who have never been to these exciting events, the "BESIR" is the Deacon to "BE SIR". It is an office which the Late Collector holds for a matter of hours before becoming the Deacon at the Choosing Meeting the following morning. John gave a great speech full of humour and warmth. 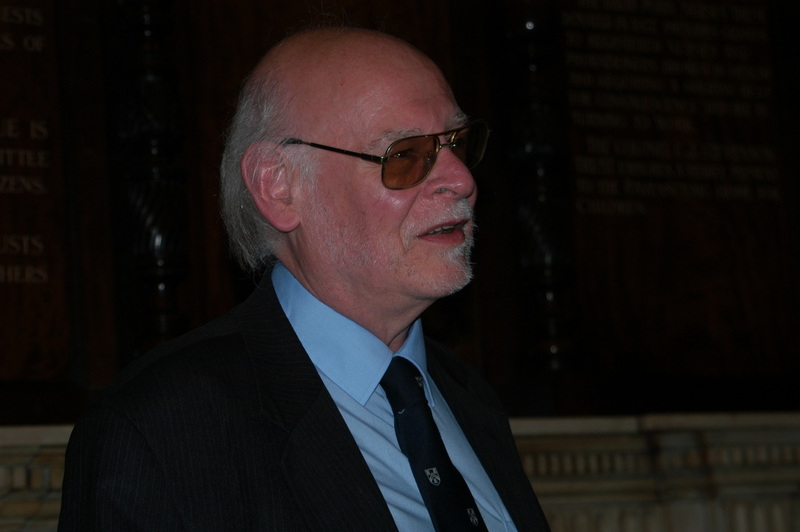 Normally it is the Deacon who toasts the BESIR, but as the Deacon was about to become Deacon for a second year in a row he had decided to ask Dr. John to do the honours for him as Dr. John and Past Deacon Graham Kelly had been instrumental in persuading the Deacon to become Collector a few years previously.. The BESIR then replied to the toast and was expected to sing a song called the BESIR song. Unfortunately our Deacon has absolutely no ability at singing and is reputed to have a phobia about singing as in the past he was always informed that he was a terrible singer. So instead of singing, the BESIR gave everyone present a wee pot of BESIR Bryce's Blairlogie Raspberry Jam, grown; picked; cooked and potted by himself. But he was not to get off Scot Free as he stood beside the piano and recited the song as best as he could, unfortunately his recitation was not even in time with the music. All agreed that it was better to receive the jam rather than hear the BESIR sing. The other tradition relating to the BESIR is that the BESIR is expected to supply a cake which is then cut up and what is not consumed at the meal is taken over to the Steps Bar where at the end of the evening a BESIR party takes place. The next item on the Agenda was the Deacon who gave a toast to the Collector. Both have worked closely together over the past year and the Deacon expressed his gratitude and appreciation for all the help and assistance provided by Collector David Bannerman. He finished by stating that he believed that David would make an excellent Deacon after his fallow year. 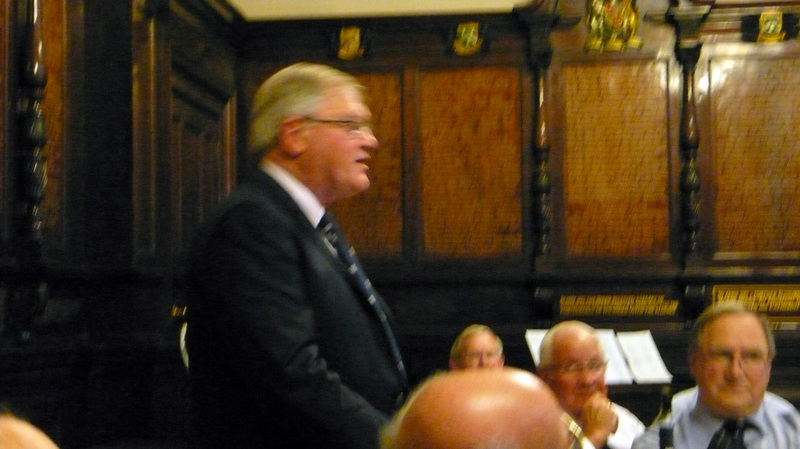 Collector David Bannerman made an excellent response to the toast to him and indicated that he would continue to work hard for the benefit of the Incorporation. 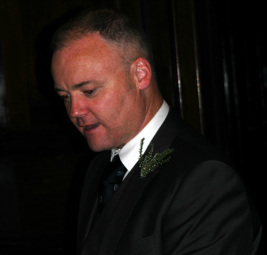 He also stated that he was looking forward to his fallow year before taking up the reins of Deacon in 2015. Past Deacon Stuart Orr then informed the people that the Merry Masons had won the Curling Championship for a second year in a row. This has been reported on a previous page of the website and for details, please click here. The Masons’ annual outing took us down the coast to Glasgow Gailes where an extremely competitive day's golf was enjoyed by a dozen of varying ages from the Merry Masons. For the third time in four years the Peter White trophy was claimed by craftsman Brian Hughes pipping a distraught three-putting Past-Deacon Sutherland by a solitary point on the final hole! The McLaren Cups have two new names on them namely Iain Cameron and 19year-old Allan Sutherland. Confidence was high amongst the Mason’s golfing squad prior to the playing of the inter-craft Borland Trophy at Mar Hall last week especially as we hoped to enter a couple of teams under the recently revised format. Due to late call-offs however the Merry Masons were soon down to the bare bones but those that appeared did the honours and put all to the sword, especially those pesky Wrights and brought home the magnificent silverware adorning the Deacon's table tonight. Many congratulations to Past-Deacon Stuart Orr and Craftsmen Iain Cameron, Peter McMillan and our lucky mascot Tony Silverdale!! This is the Masons’ third success this Millennium and every effort will be exercised next year to complete a grand slam by hopefully also regaining the Trades House Shield, which we haven't won since Hugh Sutherland partnered the late Past-Deacon Jim Barron many moons ago. Gary Smith replying as a New Laid Stane. The Deacon then toasted the New Laid Stanes. He emphasised that there were two elements to keeping the Incorporation vibrant and they were New Members and the second New Laid Stanes. New Laid Stanes are the new members on the Master Court and it is the new ideas and approaches which will prevent the Incorporation from stagnating. Gary Smith had been able to attend and he gave a superb response and a commitment to help the Incorporation in every way that he could. 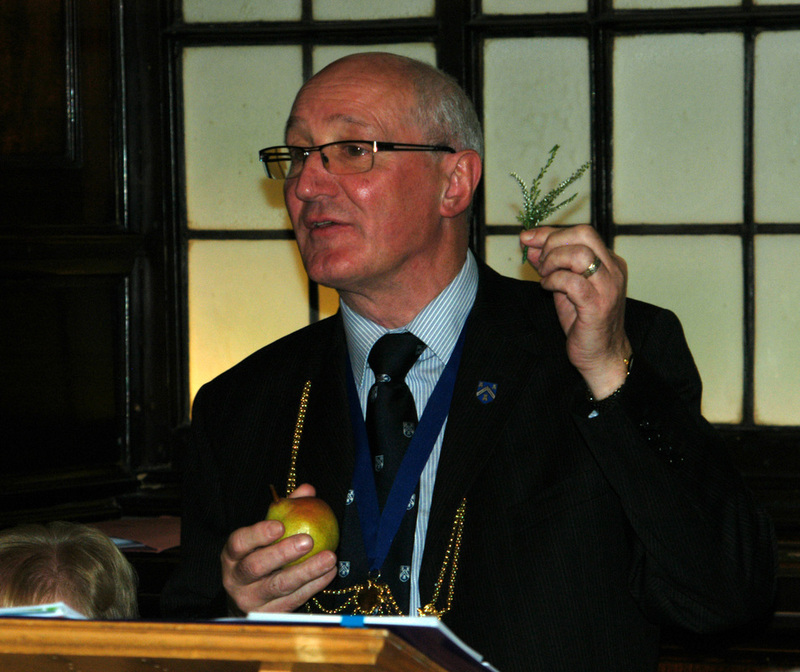 Next came the telling of the tale of the origins of the Pear Eating by Past Deacon Stuart Orr. Stuart recited how in times gone past when one of the Deacons wishing to be elected, invited a number of people with the vote to come round to his large fancy house on the night before the election. He plied them all with drink and food and prior to leaving he gave them all some pears from the pear tree in his garden. All were also asked to wear a white sprig of heather in their lapel on the following day to indicate that they would be voting for him. History does not tell us if he was successful or not, but to this day we continue the tradition and at Choosing Meeting and Choosing Dinner, many will be seen displaying the white heather. 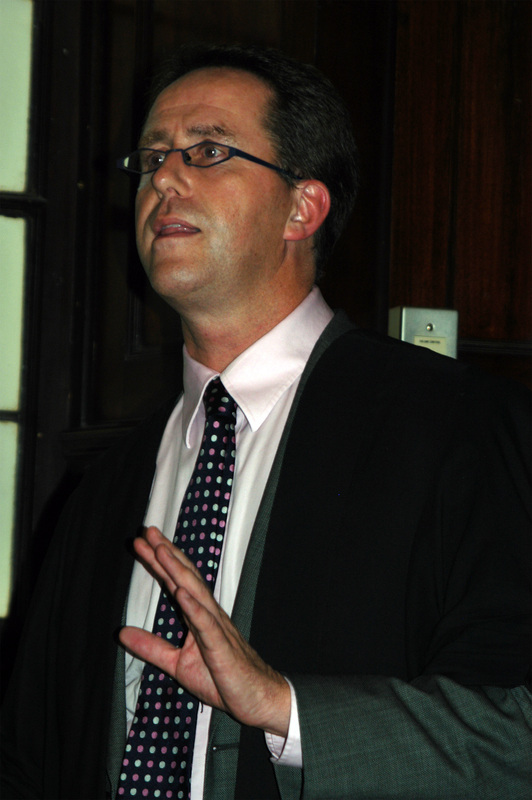 Clerk Tom Monteith replying to the toast. The Pear Eating is one of the few events that there is an opportunity for the craft to mark their appreciation of the Clerk. The Deacon toasted the Clerk and made it clear for all that Tom Monteith was a true treasure who gave the Master Court sage advice and guidance. 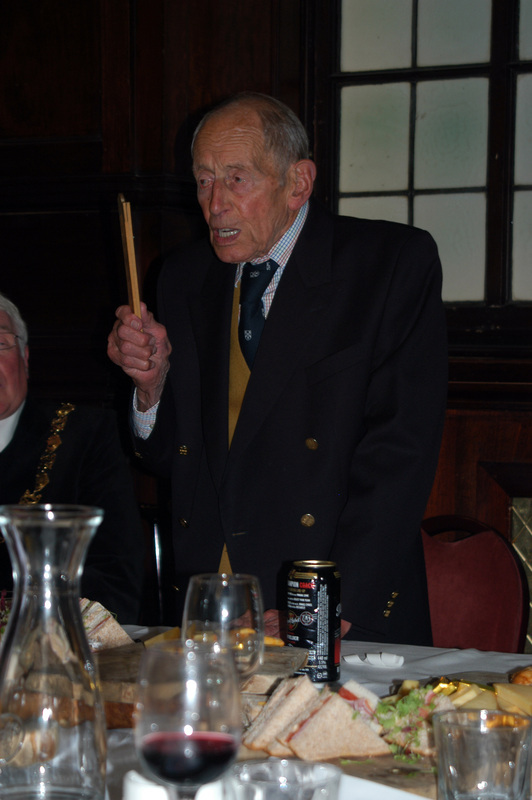 Tom then had an opportunity to reply to his toast and as part of this he had prepared a humorous poem for the Deacon which outlined some of his positive and negative aspects as well as some of his achievements. We will be adding some of Tom's points to this area very soon. Late Deacon Brian Evans toasting the Deacon. As always, Brian joked about and complimented the Deacon on the work that he has done for the Incorporation. After the toast the Deacon thanked Brian and noted his appreciation and regret that he would have to do another 42 or so toasts to him over the coming year. Throughout the evening entertainment was provided by Ian Macpherson singing and at the end of the evening conducting a sing along of many old popular songs. Alan McLennan also provided some light relief by reciting a poem about a racing dog and then making a plea for those who wished to own a pet, to get a rescue dog and save a life. Past Deacon James Hamiiton Smith Rapping the Shed. At the end of the evening and in time honoured tradition, James Hamilton Smith as the eldest Deacon closed the evening by explaining the traditions of Rapping the Shed and then rapping on the table. Jimmy explained that in times gone by, the Wrights built the Masons Shed, but they were never allowed into it. At the end of the day when the Masons were to stop work, the foreman would rap the shed and call out "STOP STOP STOP ALL THE MASONS IN THE SHED STOP STOP STOP". The masons would then put down their tools and go home. The tradition continues to this day and the shed or table is rapped three times with a slight pause then seven times then a slight pause before the last three raps. The rapping is done as if the words were being said. James explained that he had asked a stone mason if this ritual still continues to this day, to which the mason replied "Eh! ", so apparently not.